Americans aren't saving enough for retirement. One-third of all adults have zero retirement savings, and 23% have less than $10,000 tucked away, according to a new study by Merrill Lynch and Age Wave on retirement savings. The study surveyed nearly 5,000 people across the country age 25 and older. Naturally, many people are concerned they'll face economic strain after they exit the workforce. 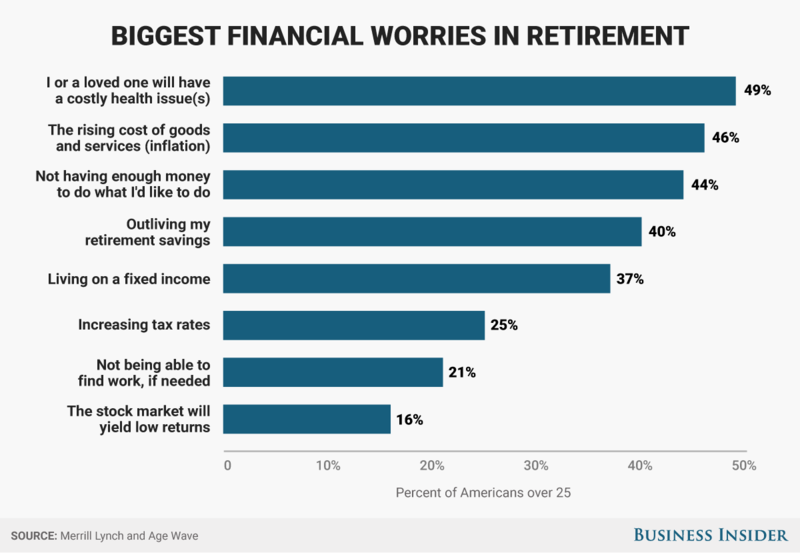 Americans don't necessarily aim to be rich in retirement, but rather they want security and the ability to live comfortably without fear of running out of money. While 88% of people aspire to save enough to have financial peace of mind, only 12% say they want to accumulate as much wealth as possible, the study reports. Americans share three big concerns about threats to their retirement savings: an expensive health issue impacting themselves or a loved one, inflation making it more expensive to afford basic living costs, and the fear of not having enough money to do all the things they want to do. "For most retirees, health is considered the 'biggest wildcard' in retirement — both the key to a happy retirement and the biggest overall worry," Cyndi Hutchins, director of financial gerontology for Bank of America Merrill Lynch, told Business Insider. "Not only can a costly health expense jeopardize previous financial planning, but it may also force people into retirement earlier than expected, therefore posing a double threat to retirement financial security." Hutchins explains that Americans also struggle to balance their future needs with their current priorities, making it difficult to discern how much money to dedicate to retirement accounts versus how much to put toward more pressing goals. "These worries are compounded by concerns that the cost of key life expenses will only rise over people's' lifetimes," she says. "To best prepare, people should be mapping out near-term goals against long-term financial considerations and separating 'must-haves' from 'want-to-haves,' all while creating an emergency fund for unexpected costs and rising expenses that may occur down the road." Most people don't have any financial role models. Half of pre-retirees age 50 and older say they don't have any positive role models when it comes to handling finances. Though some say they can turn to a parent or financial adviser for advice, 40% still don't understand basic terms associated with retirement savings, such as IRA and 401(k). Financial decisions are second-guessed more than any other major life decision. The study found that 39% of people think twice about money decisions more than anything else. Only 18% of people give pause to career-related choices above all else, and even fewer — a mere 15% — second-guess decisions about their health the most. 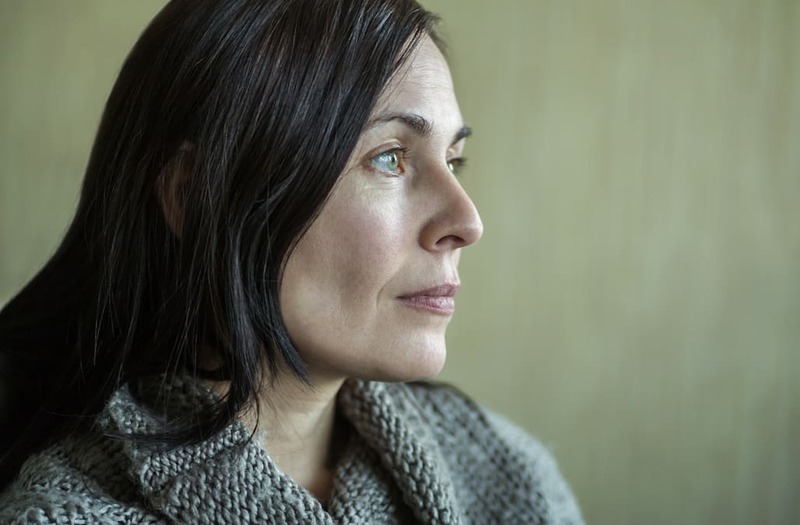 Though the study's findings are alarming for those entering retirement in the next few years, for many people these fears can still be mitigated before they're realized. You can start preparing for retirement by contributing 10% to 15% of your income to your employer's 401(k) plan, a percentage of which is matched by many companies — essentially handing you free money. It's also smart to consider putting money toward a Roth IRA or traditional IRA, individual retirement accounts with different contribution limits and tax structures. It's worth noting that it's never too early to start saving for retirement. That's especially true for millennials, who still have time to take advantage of decades of compound interest.